I was recently handed a copy of How to Make Webcomics , a book written by the 4 online comic creators who comprise Half Pixel Studios, Brad Guigar (Evil Inc), Dave Kellet (Starslip Crisis), Kris Straub (Sheldon) & Scott Kurtz (PVP). A lot of me wishes that I had something like this 3 years ago when I was launching our own online comics. It has been a long journey figuring out the ins and outs of online comics. For the newbie out there, this book would serve as a worthy guide and probably shave months of time off your learning curve. Weighing in at almost 200 pages this book is resource heavy with plenty of useful links for the reader to go and search out online afterwards. After the introduction the book covers formats, prepping your pages for online distribution, writing, graphic design for your comics site. Then it delves into different aspects of marketing (branding, building a community) and probably the most poured over chapter, 9: Monetizing your Webcomic. A comics blog The Floating Lightbulb has quite a detailed post on how they feel the monetizing strategies of the book are flawed. They’re conducting an experiment. The last third goes over conventions and steps to take after you’ve been at it for a while. Interspersed between the various sections are Hot Seat segments where each creator takes a turned getting grilled by the other three. The whole book is written in a pleasant conversational tone and is surprisingly consistent given the number of authors involved. 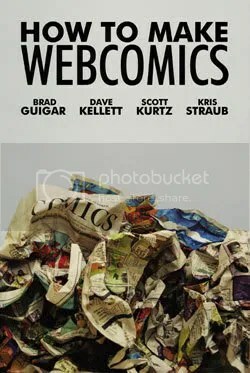 Given that this book is entitled, HOW TO MAKE WEBCOMICS, it has taken a few pot shots from several bloggers. This has also been referred to as a bible. That’s not fair as the amount of reference books for webcomics at this point is pretty slim. It’s probably the strongest entry so far but I think the definitive guide has yet to be penned. Webcomics have only been around for little over a decade. There’s still a lot to be determined. The big four comic publishers are slowly making their way online through different initiatives. Marvel has a subscription service, DC has Zuda and Darkhorse has a strong MySpace presence. Thousands of other creators will be putting up online comics by the end of the decade and there’ll be new shining stars and new ways to make money by publishing online. By the book here on Amazon . Before ending this, let’s give 1000 kudos to DJ Coffman for taking the time out to show noobs how to host their own webcomic. Run don’t walk to this post, it’ll save lives.